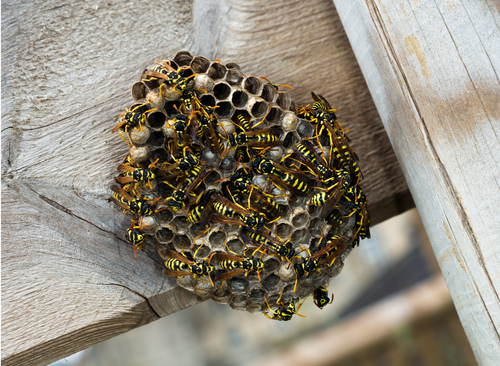 If you are experiencing a problem with wasps- call out the 24/7 professionals on 07787 422022 – Khitan Bird and Pest Solutions – The Professional Choice. Khitan Bird and Pest Solutions have been busy during the month of July as the wasp season starts to gather pace. We have been completing wasp removals for concerned homeowners who are pregnant or suffer with anaphylactic shock or just being stung by wasps nesting near to doorways or opening windows. We have been completing call-outs for businesses who are concerned with maintaining a safe working environment for its employees in Shropshire, Shrewsbury, Telford, Whitchurch, Church Stretton, Much Wenlock, Oswestry, Wrexham, St Asaph, Malpas, Wolverhampton.